Plant Health Australia has developed the Biosecurity Portal with funding provided by the Australian Government Department of Agriculture and Water Resources. 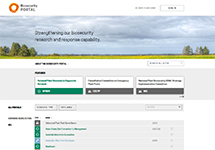 The Portal provides ready access to information about biosecurity surveillance, diagnostics, training, technical information, tools, national policies and strategies, and legislation to plant health professionals and stakeholders across government, industry and the community. The vision for the Portal is to integrate biosecurity activities, scientific capabilities and analysis across the biosecurity continuum. PHA’s Portal project delivers on aspects of the National Plant Biosecurity Strategy (specifically Recommendations 8, 9, 10 and 15), the endorsed strategic direction for national plant biosecurity activities to 2020. The Portal will also deliver against priority reform areas identified in the Intergovernmental Agreement on Biosecurity​, which aims to strengthen collaboration between Australian governments to address biosecurity issues. PHA has implemented the IT infrastructure, developed the architecture and demonstrated functionality by creating an initial set of knowledge bases and collaboration sites. Plant Health Australia will continue to own and manage the development of the Biosecurity Portal with guidance from the Portal Management Committee, comprised of representatives from PHA and the Australian Government Department of Agriculture.